The UFC has returned to Glasgow with a with a very ordinary card tailored to the European market. 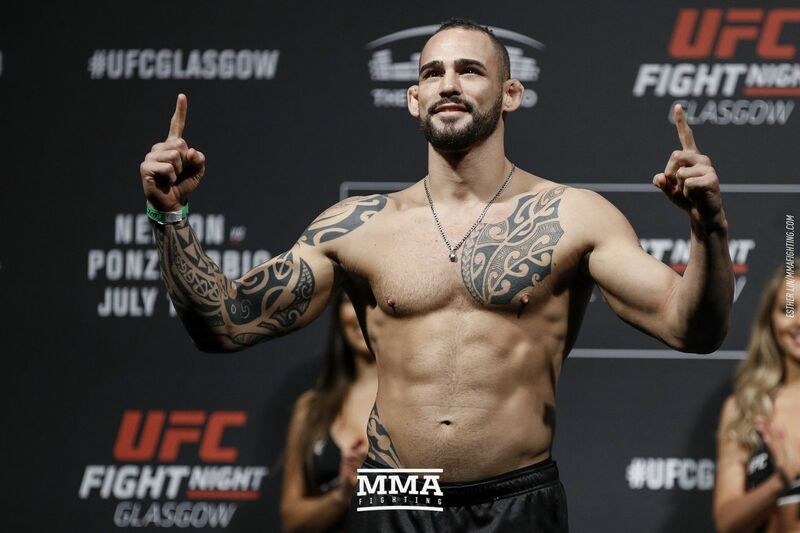 In the main event, ranked welterweights Gunnar Nelson and Santiago Ponzinibbio will battle to see who will become a serious contender in the division. This Sunday card also features a solid women’s strawweight bout between Joanne Calderwood and Cynthia Calvillo and fan friendly contests in Stevie Ray vs. Paul Felder, and Alexandre Pantoja vs. Neil Seery. Where: The SSE Hydro, Glasgow, Scotland. When: Sunday, July 16. The two-fight UFC Fight Pass preliminary card begins at 12 p.m. ET, the four-fight FOX Sports 1 preliminary card begins at 1 p.m. ET, and the six-fight main card begins at 3 p.m. ET also on FOX Sports 1. The winner of this fight should enter the contender mix in the UFC’s welterweight division. Gunnar Nelson, ranked No. 8, has had a fairly disappointing run in the UFC. Nelson entered the UFC in 2012 and many thought he was going to be a future world champion. The SGB Ireland fighter won his first four fights in the UFC, but then followed up with a 3-2 record, losing to Rick Story and Demian Maia. Nelson has proven to be a skilled fighter, but seems unable to shift into the next gear when facing high-level opposition. I think we know by now what Nelson is capable of, and although that can change for the 28-year-old, I don’t have any indications that tell me Nelson has reached a new level in MMA game. So is Ponzinibbio part of that high top 10 category that Nelson hasn’t been able to get through? I think so. Ponzinibbio has a strength edge over most welterweights – including Nelson – and he utilizes it well in his takedown defense. The Argentine is a very skilled striker that has fight-ending power. Also, Ponzinibbio has plenty of momentum, having won his last four, and just seems to be new blood in the UFC’s 170-pound division. I think this will be a good showing for Ponzinibbio. I see Ponzinibbio defending takedowns and getting a lead on the feet. I think Nelson’s lack of urgency will really hurt him in this bout. Perfect step up in competition for Cynthia Calvillo. The Team Alpha Male prospect has shown plenty of promise in both her UFC fights. Calvillo is a scrappy fighter with a very efficient grappling game and a respectable stand up. Calvillo might only be 5-0 in MMA, but she fights like a veteran and never really commits any rookie mistakes. Joanne Calderwood is a seasoned vet and one of the most well-rounded fighters in the strawweight division. Calderwood can grapple from both the top and bottom, and she’s comfortable on her feet. This is a great fight and great matchmaking. Calvillo seems to be the real deal and the future of the strawweight division, but we will only know for sure if she gets past the veteran. I find Calvillo to be more aggressive than Calderwood and I see her pushing the pace here. I also see Calvillo utilizing her wrestling to get the fight to the ground where she should have a clear advantage. This will likely be the Fight of the Night. Paul Felder is an exciting muay thai striker that’s not afraid of getting into a firefight. Felder has very high technique, he’s quick with his combinations, and lands with power. He also has solid striking output and good conditioning to back up his pace. On the other hand, Stevie Ray is very similar. The Scottish fighter can trade heavy leather, but also has takedowns and movement in his arsenal to take the fight elsewhere. For those who’ve been reading my predictions for some time now, know that I’m pretty high Ray. I think Ray can break into the top 15 of the UFC lightweight rankings. With that being said, I think Ray has a huge edge on the ground. Ray is capable of striking with Felder and if things get ugly, he can take the fight to the ground. Ryan Janes is a well-rounded fighter with good submission and decent striking. Janes fights at a constant pace, and is a durable fighter. However, his opponent, Jack Marshman, tops him in most areas of the fight game. Marshman is the more experienced fighter and the better striker too. Janes might have an edge on the ground, but Marshman is good enough to hold his own if the fight were to hit the ground. I think Marshman is far more active and skilled on his feet than Janes. That should get him a dominant victory here. Khalil Rountree vs. Paul Craig is the classic grappler vs. striker match up. The Scottish fighter has okay stand up and a very dangerous, slick ground game. Craig is also presents physical challenges to his opponents being a very strong and long fighter for the weight class. Craig has takedowns in his game, but the set ups can be questionable. Meanwhile, Rountree is not great on the ground, at least historically, but on the feet, Rountree is quick and hits very hard. In his last bout against Daniel Jolly, we saw improvements in Rountree’s takedown defense. Craig is very skilled, but his set ups and entries to takedowns make me hesitant to pick him. I see Rountree stopping Craig’s takedown attempts and turning this into a striking battle. Interesting fight here between two UFC newcomers. James Mulheron is a quick, dynamic striker that can put clean combinations together on his feet. Mulheron’s striking arsenal is very well equipped, as he uses a good variety of attacks. The British heavyweight sports an MMA record of 11-1. His opponent Justin Willis significantly less experienced than Mulheron, as he’s only 4-1 in MMA. The catch here is that Willis comes from a more prestigious team – American Kickboxing Academy. Willis is not a bad striker, but where he truly shines is the ground. Willis is powerful, possesses decent takedowns, and has good understanding of grappling. This comes down to whether or not Mulheron can stop Willis’ takedowns and clinch control. On the feet, the more experienced and faster Mulheron should have a edge over Willis. Tough call.